Save about 40% off FMNCC's discontinued candles. There is nothing wrong with these particular scents on sale. Save about 37% off FMNCC's discontinued candles. There is nothing wrong with these particular scents on sale. Our 20oz. emma jar with a modern dome lid carries a black label base with gold embossed raised letter accents on the top portion and a raised gold matte bottom portion with bright gold sunken details. This candle has two wicks and the average burn time is 120 hours. 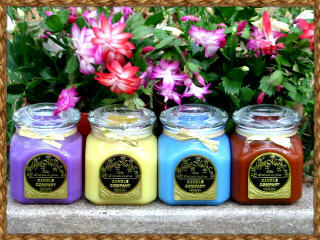 Save about 62% off FMNCC's candles. These candles are not perfect! The fragrance oil has seeped out of the wax making the candles look bad. 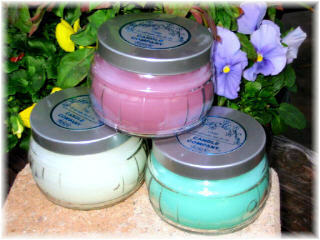 Save about 58% off FMNCC's candles. These candles are not perfect! The fragrance oil has seeped out of the wax making the candles look bad. Save a little over 30% off FMNCC's discontinued warmers. White Swirl & Gray Stoneware Ceramic Candle Warmer. 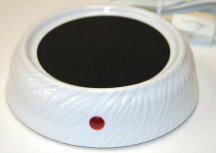 The ceramic warmers are a great way to scent your home without using an open flame. Some places do not allow candles to be burned. The ceramic candle warmer is a great alternative in places like business offices, dorms, schools, retirements centers, etc. No smoke or soot either! The warmer will fit candles up to approximately 3 1/4" wide. Measurements: 5 3/8" D, Heating Element Diameter 3 3/4", 1 1/2" H 120 Volts AC Only 60Hz 24 Watts.